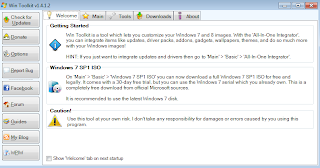 SAGITA COM - Win Toolkit 1.4.1 Full Version dirancang untuk membantu Anda mengintegrasikan Update, Driver, Paket Tema Tweaks, Wallpaper, Addons, SFX Installers, Gadget dan menghapus hal-hal yang tidak Anda inginkan dari disk instalasi Windows. Win Toolkit adalah program pertama dari jenisnya untuk mengintegrasikan program favorit Anda ke dalam instalasi Windows. Ini termasuk fitur All-In-One, Komponen Removal, AIO Disk maker, ISO Maker, Registry Editor Hive, Solor SP1 Update, USB Boot Prep, dll. This is the greatest tool in Win Toolkit, it’s let you integrate, Addons, Remove Components, Drivers, Gadgets, Language Packs, Edit Services, Silent Installs, SFX, Theme Packs, Tweaks, Updates and Wallpapers!ISO Maker. This is what it says on the tin, it creates your ISO file for you to burn! Now supports UEFI!Win Toolkit Guides. A nice direct link to guides on how to use Win Toolkit. USB Boot Prep. Prepares your USB stick so you can install Windows from it, obviously your computer needs to support USB booting!WIM Manager. Manage and edit your install.wim, for example you can rename images, delete images, add new ones, create ISO, rebuild, mount, unmount, etc… You can also use this tool to integrate your unattended files. FIX: Fixed sorting error when update changed group. FIX: Fixed IE langpack integrating before IE itself. FIX: RunOnce did not install anything. FIX: RunOnce hanged on looking for installation files. Upgrade image option added for WIM Manager. Improved saving image status reporting. Added keyboard shortcuts on WIM Manager.